Fellow Aussies will remember the Great Banana Shortage of 2010 when Cyclone Larry destroyed up to 90% of Australia's banana crops. I think I actually got hubby a banana for his birthday that year! Nothing beats homemade banana bread. Not only does it taste great but when you've got cheap bananas you can almost make a loaf for less than you can buy a single slice of it at some cafes ($4.75 at Gloria Jeans on the weekend). I'm still trying to cut back on wheat and dairy but in a way that's not particularly noticeable to the rest of the family. Here I swapped out half the wheat flour for white spelt and used non-dairy milk and butter. You can of course use any flour, milk and butter you like. 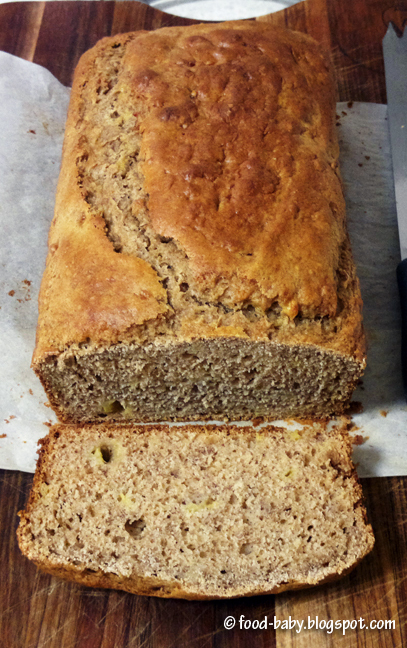 This made a lovely moist loaf with a heady banana flavour and gorgeous aroma from the spices. Normally I would use dark brown sugar in something like this but had run out so I made do. As you do. I froze most of the loaf already sliced so that's this week's lunchbox treat sorted. Or maybe my breakfast! Preheat oven to 180 degrees (160 degrees fan forced). Spray a loaf tin (approx 11 x 21cm) with oil spray and line the base and 2 sides with baking paper, allowing it to overhang. Place the flours, baking powder, cinnamon, allspice, salt and brown sugar in a large bowl and whisk to combine. In a separate bowl mix together the mashed banana, eggs, milk, melted butter and golden syrup. Add the banana mixture to the dry ingredients and mix gently until just combined. Spoon into the prepared tin and bake for 40-50 minutes or until a skewer comes out clean. Leave in the pan for 5 minutes before turning out onto a wire rack to cool completely. This cake will keep for 3 days in an airtight container on the bench or slice and freeze for up to 1 month. Looks like a great recipe. Thanks for sharing.